Use precision electronic circuit to eliminate the crossover distortion and harmonic distortion. Good cardioid pickup output and high sensitivity. Low noise. Wide dynamic range. Suitable especially for studios, recording studios, broadcasting stations, stage performances and computer in sound reinforcement or recording, to pick up voice or instruments, indoors or outdoors. *Color: Blue *Material: Metal Note: Don't drop, hit or apply strong shock to it. To maintain the sensitivity and quality of sound reproducing, avoid exposing it to moisture and extreme temperatures. Designed for most standard microphones. Keep your microphone clean and help extend it's lifetime. This is a very nice shock mount for most large diaphragm condenser microphone. 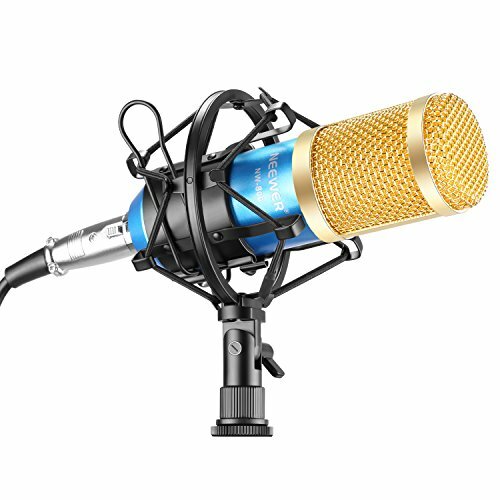 The Set Includes: (1)Blue Professional Condenser Microphone + (1)Microphone Shock Mount + (1)Ball-type Anti-wind Foam Cap + (1)Microphone Power Cable. The ball-type anti-wind foam cap can protect microphone against wind interference and singers' spit.